TO REGISTER: Our Mega Event is FREE! Simply log a "WILL ATTEND" on this cache page with the number of people on your team (also tell us which state or country you're from so we can add you to the map!). During the event, SIGN IN at Regner Park on Friday afternoon or Saturday morning to Sign the official log book. Register early! The first teams to log a will attend will be guaranteed a bag! Free Official Drawstring Bags with coupons, city information, and various contest entry forms will be available on a first come, first serve basis at Regner Park along with the Official Cache Ba$h Booklet and Playing Card. Registered teams will also receive a Cash Prize Raffle Ticket for each member of the team that is present at check-in. The raffle is on Saturday, August 10, at 6:00pm. You must be present to win. General Prize Drawing Prizes include geocoins, cache containers, Prime membership, gift certificates, and more. Each registered team can earn raffle tickets by finding our 50 geocaches, playing geo-bingo, or playing other official games. Must be present to win. 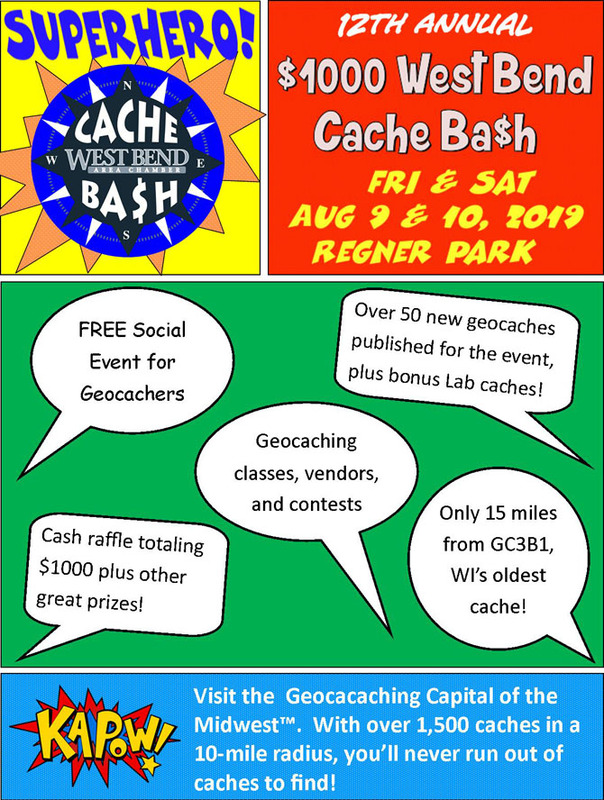 Cache Ba$h Geocoin for Sale A limited edition 2019 West Bend Cache Ba$h Geocoin will be sold on a first come, first served basis at Regner park. Credit cards are now accepted! Geocaching Classes! Introduction to Geocaching will teach you the basics of geocaching and how to sign up and find geocaches using a GPSr or a Smartphone. The committee is discussing adding additional classes. What would interest you?? Lab Caches There will be Lab Caches only available during our event! Stay tuned for details. Signal the Frog Will Signal the Frog make an appearance again? Stay tuned. Sunday Pancake Breakfast Sunday All-you-can eat Pancake Breakfast at Regner Park - by Wisconsin Geocaching Association. Plus more fun games. See schedule below for details. Stay tuned for details. Other satellite events See schedule for details. Typically involves a Thursday Meet and Greet, a Friday Flash Mob, and perhaps a CITO event. Stay tuned as the committee meets to discuss events for 2019. There are typically activities that run from Thursday until Sunday, with Friday and Saturday as the main event days. View featured hotel and camping options here at the West Bend Area Chamber website. Make your reservations early! If you are having trouble finding open rooms, call the Chamber for assistance. ATTENTION! COUNTY PARK INFO HERE!! Select DAILY PASS, and enter this code: (Stay tuned for code for 2019). You have up to 7 days to enter this code for your license plate. The pass covers all county parks for the weekend. City parks remain free. Attention Dog Owners!According to West Bend ordinance, pets are not allowed in City parks, including Regner Park. West Bend has an off-leash dog park: “Rolf’s Park” is comprised of 10 fenced-in acres and is only 5 minutes from Regner Park--Cache Ba$h Headquarters! Ridge Run Park and County parks also allow dogs. Disclaimer:Event attendees assume all risks in seeking geocaches. Neither the West Bend Chamber of Commerce, West Bend Parks and Recreation Department, nor any of its members or volunteers, may be held liable for any direct, indirect, punitive or consequential damages connected with this event. Are YOU interested in joining our team as a volunteer or committee member or hider or lab cache creator??! Contact us! We especially need volunteers to help with kids activities during the Ba$h!